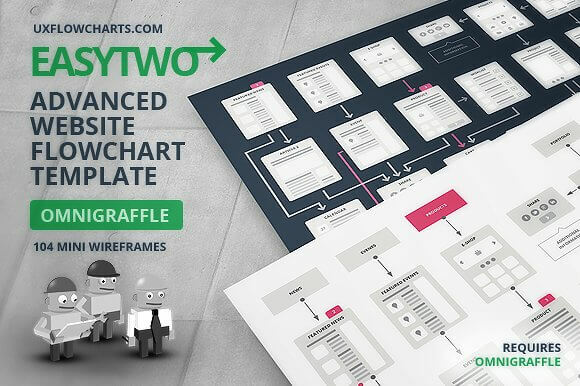 Using EasyTwo Advanced Website Flowchart OmniGraffle Stencil you can create professional flowcharts fast and easy. Free Product Updates Included: if you can't find mini wireframe style or functionality you need, just let us know and it will be included in future product update immediately. Flowchart template files include 104 common website page mini wireframes, page layouts, a bunch of other flowchart related elements, two arrows styles, two already built flowchart examples, two empty flowchart placeholders on which flowcharts can be built. Use any of the included flowchart examples as a starting point for your website flowchart or create your own website structure using empty flowchart placeholder by adding any of 104 precisely crafted mini wireframes according your needs. Add titles, change colors, or add backgrounds. And... of course, all these goods are built in vectors!